From the early days we have made it our strategy and company philosophy to assist our customers with a very direct and high quality service. As such we allow our customers to concentrate on their core business not having to worry about further transport needs. To this purpose we employ a team of well-trained and experienced staff in each domain. A well structured internal organization. A limited number, but high performing staff. Well described procedures for each employee and for each task in our organization. Continuous on the job training of our staff, allowing for new developments. Continuous assessment of our performance. The limited - but efficient – number of staff in our offices also allows for a direct contact with the customer, a very quick response and information feedback, and a 100 % correct administrative follow-up. Our long experience together with our well trained and experienced team is the sound basis for our quality service and performance. We proud ourselves on presenting these services to our customers at an honest rate acceptable and workable for both partners. 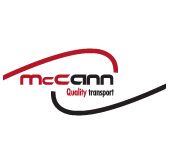 All drivers and subcontractors to McCann are in direct contact 24/7 with our planning desk either via Mobile phone and/or track and trace. All driver – subcontractors are contractually linked with McCann. All drivers receive a copy of our “drivers Manual“ which is part of our quality Iso 9001:2015 manual and are constantly updated with new instructions and information if so required. All trailers can be live traced via the online tracking system of Transics. After delivery all files are transmitted to our administration department. All invoices will be sent in line with your demands and specifications.